European corn borer (ECB) adult activity is on the increase, with low catches in parts of the state now. The second adult flight is underway. Areas of highest activity are scattered throughout the state with one notable hot spot in central Morris County (see ECB map). Corn earworm moths (CEW) activity is increasing, with more consistent catches in the southern half of the state. Blacklight traps further north in the state are more individuals, although numbers are still fairly low. Overall activity is reasonably low for this time of year, but sweet corn plantings south of Trenton are at significant risk from this population (see CEW Map). Catches in DE and VA are consistent with ours, and trap catches published from North Carolina appear to have peaked over a week ago. This leaves no indication that there is an imminent, large-scale influx of moths headed for NJ at this time. As always, we will monitor our populations and report immediately should such an event occur. The limited CEW pheromone trap network in the southern counties is also showing greater increases over the past week. Activity has become more consistent throughout the south, resulting in a broad area where a 3-4 day silk spray schedule (green area) is recommended (see CEW pheromone map). It is critical that growers monitor local CEW moth numbers. 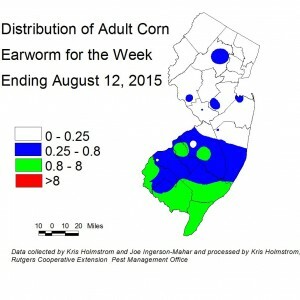 Fall armyworm (FAW) infestations continue throughout NJ, with double digit infestation rates throughout the state. This pest can be devastating to small corn plants. Fields down to seedling stage should be scouted weekly for signs of infestation. FAW do not respond well to pyrethroid insecticides. The most useful products are those in the IRAC group 28 class (Coragen, Exirel, Belt) or the IRAC group 5 class (Radiant, Entrust), or combination products including these classes. See the 2015 Commercial Vegetable Recommendations Guide for insecticides effective against FAW. 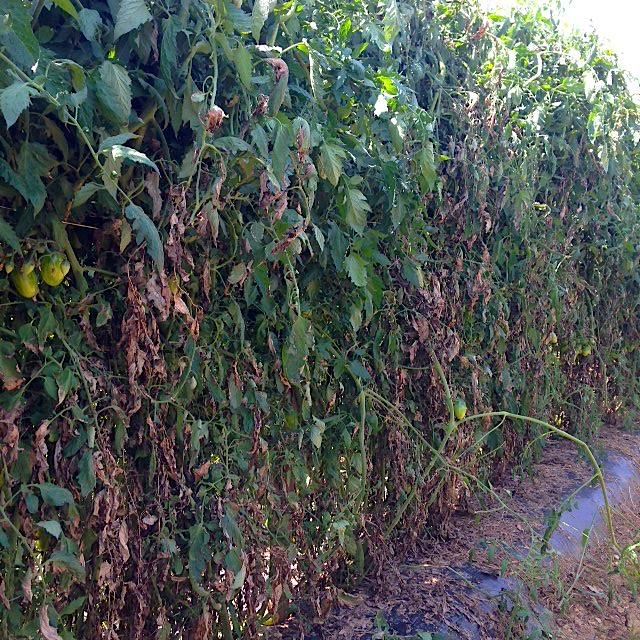 Some indeterminate heirloom varieties are exhibiting severe symptoms of early blight (see photos). On these plants, infected leaves tend to turn greenish gray as they dry out, rather than the typical brown normally associated with early blight. Some growers have confused this with late blight. However, the severe early blight infections do not exhibit any white spores on the underside of the leaves, and petioles and fruit are not attacked as is the case with late blight. The return of ECB adults in our area is a reminder that this pest can cause injury to pepper fruit. As local blacklight trap catches reach or exceed 1 moth/night, growers should consider their peppers to be at risk of infestation. Several options exist for control, including soil (drip) applied IRAC group 2i materials like Coragen or foliar applications of IRAC group 5 materials like Radiant or the OMRI approved version, Entrust. See the 2015 Commercial Vegetable Recommendations Guide for insecticides effective against ECB. No weevils have been trapped in the past week and as far as known, there are no infested fields. BMSB numbers remained low in NJ blacklight traps this past week, with continued higher activity in one trap in Cape May County. These catches are too low to create a map. As yet, no fruit injury has been discovered in scouted pepper plantings. Growers should consider applying both protectant and systemic fungicides to all cucurbit crops at this time, to limit loss from this disease. Additionally, many pumpkin fields are now infected with powdery mildew (PM). Protectant fungicides are warranted on any fields where PM lesions now occurring. PM does not typically occur until the host crop enters the stage of fruit enlargement. Consult the 2015 Commercial Vegetable Recommendations Guide for fungicides effective against CDM and PM. Recent warm, dry weather has caused some earlier planted fields (particularly of small fruited varieties) to begin to develop yellow leaves near the centers of the plants. This is not typically an indication of disease, but rather harsh conditions, poor air quality and plant maturity. The rains of the past two days should help produce new growth on plants that have immature fruit.